A lot of places I try out are referred to me by friends. I feel pretty lucky for all the excellent recommendations! Club Charlies in Milwaukee’s Third Ward was a recommendation that exceded expectations. For whatever reason, I thought Charlies was a hot dog joint. Maybe that was just wishful thinking. After a long day of work on Saturday, we were ready for a relaxing Sunday which including doing nothing ourselves. That’s a perfect equation for a Bloody. When we got to Club Charlies at 320 East Menomonee, we sat at the bar because the tables were pretty full. It’s not a big place, but big enough where we didn’t feel crammed. The bartender was making multiple Bloody Marys and asked right away if we’d like one. Well, of course. Spice: Since I was seated right at the bar, I asked the bartender about the Bloody Mary’s as she was making them. I was intrigued by it all because it was obvious they created their own mix. The bartender told me they infuse vodka, in house, with spices and vegetables. The mix was very smooth- not too thick but not watery at all. It had a slight smokey taste that we couldn’t put our finger on. It wasn’t very spicy, but it didn’t need to be. It was very, very well crafted. Garnish: The decorations were crafted by hand and pinned together with a bar sword. They chose celery, a beef stick, a cube of pepper-jack, a huge pickle spear, and a blue-cheese stuffed olive. I appreciated the fact that they didn’t mess around with a lemon or lime. There wasn’t anything crazy to these garnishes but it set them apart from the standard (and you may know, I have a weakness for stuffed olives). Chaser: We were offered a chaser, but I declined. TJ got one, and I noticed it was an additional $1 charge on the bill. I suppose that isn’t too bad if you must have a one. Buzz: I caught a small buzz at Club Charlies that lasted thought the excellent All-You-Can-Eat brunch buffet. Price: $7.50. I found out after I was incredibly full, Sunday’s are 2-for-1 Bloody Mary’s. What an awesome deal! They must provide it per customer because it wasn’t offered when we ordered 2 right away at the bar. We both declined. It was well worth the cost. Final thoughts: Club Charlies has been moved to the top of my list. The Eatery stayed in the top contender spot for a few weeks, but has quickly been bumped out of the way. I’d like to say it’s a hidden gem, but I think people are/have caught on. The bartender told me she makes anywhere from 50-100 Bloody Mary’s on any given weekend shift. I read some reviews after indulging at Club Charlies and was a little shocked by them, as they are quite mixed. Some reviews are most excellent, ranting and raving, while others just bash the place to pieces. I’ll gladly hop on the higher end and recommend this place to anyone looking for an excellent Sunday brunch experience. 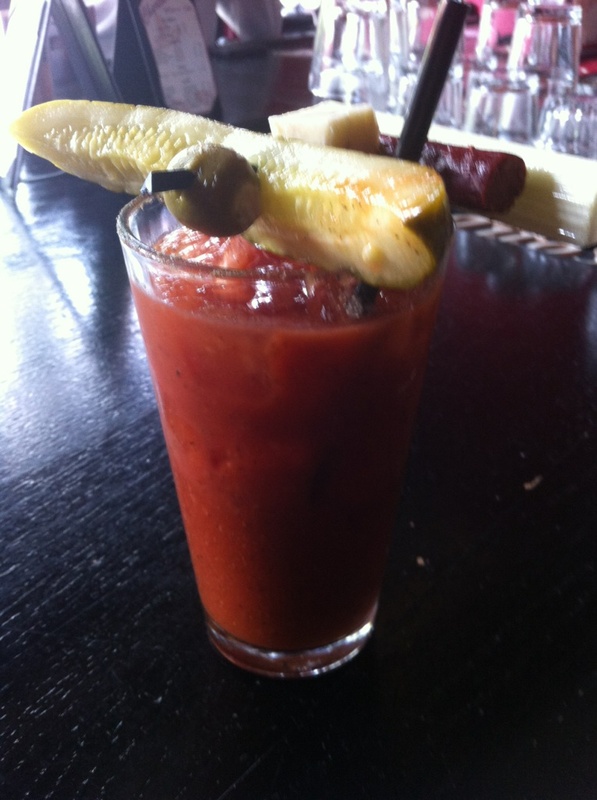 This entry was posted on May 3, 2012 by Shannon in Bloody Marys in the area and tagged Bloody, Club Charlies, Infused Bloody Mary, Milwaukee, Third Ward.